GTO, Fish, and whatever: Carribbean Red Hot Peppers! My Peppers are ripening, and are they HOT!!! 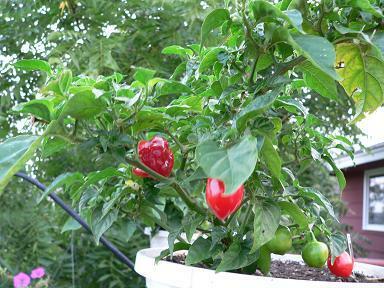 Last year I grew jalapenos and also some Carribbean Reds, which I had not heard of previously. They are a variety of Habanero. I was amazed at the heat of those peppers! They're even hotter than the orange Habs I had been growing, which were amazingly hot themselves. This year they're all I grew. I read somewhere that Carribbean Reds weigh in at around 350,000 Scoville Units. A little goes a long way. Once you get past the heat, I like the flavor of the red ones. Compared to the fruity sweetness of orange habs, the red ones have almost a rhubarb-like taste. But you do have to get by the heat first! I used to make a lot of salsa, but I found that I ate a lot more Tostitos then too. Now I usually dice up the peppers and freeze them, so I can add them to pizzas or chili, refried beans or anything else that I want to cause a searing sensation in my mouth. I should have enough to last me through the winter now, and I still have more to harvest. Maybe we won't need the furnace this winter, because I'll be sweating no matter how cold it is outside! Wow, those peppers look great! I like stuff hot myself, but I've never tried to grow my own peppers. Are you the kind of guy who can just eat 'em straight up? I can only do that with some jalepenos. There's no way I'm trying that with a habanero! Where I was at in China, the people in that area ate LOTS of peppers. It was pretty cool because walking down the street, you would see these huge 3 to 5-foot strands of red peppers hanging outside of people's balconies, dangling out to dry in the sun. I have never heard of Scoville units. Wow. I guess learned something new today. I CAN eat jalapenos straight up, and have, but I typically don't because I'm not wild about their flavor. I like the heat and they make for a pretty salsa with the green color they add. Only a fool would try munching on a whole habanero! I do prefer the flavor, but there's less of it because you use so much less in whatever you're preparing than you would with jalapenos. I've seen those bunches of peppers you mentioned for sale in Mexican markets, but never bought any there. Talk about buying in bulk! I thought the red letters would be appropriate, though I didn't think anyone would notice.